We saw a little bit of Friday The 13th: The Game late last year, but it wasn't particularly helpful: the asymmetrical multiplayer horror game has a promising concept, but that footage literally kept us in the dark. The video above doesn't showcase gameplay, but it does prove that Jason Voorhees can smash through doorways with his trusty axe, which is lucky, because that's one of his favourite things to do. 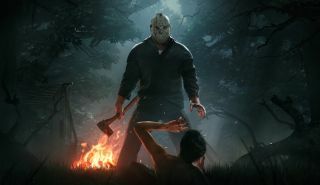 Developed by Gun Media, Friday The 13th: The Game is expected to release this autumn (or spring in Australia). The multiplayer-focused survival horror involves one player controlling old mate Jason, and seven players trying to survive his interest. For more info, there's a tonne of developer diaries and videos on the game's Kickstarter website.